One of the specialities of Chalmers Constructions Pty Ltd are basement works, typically used for basement carparks. 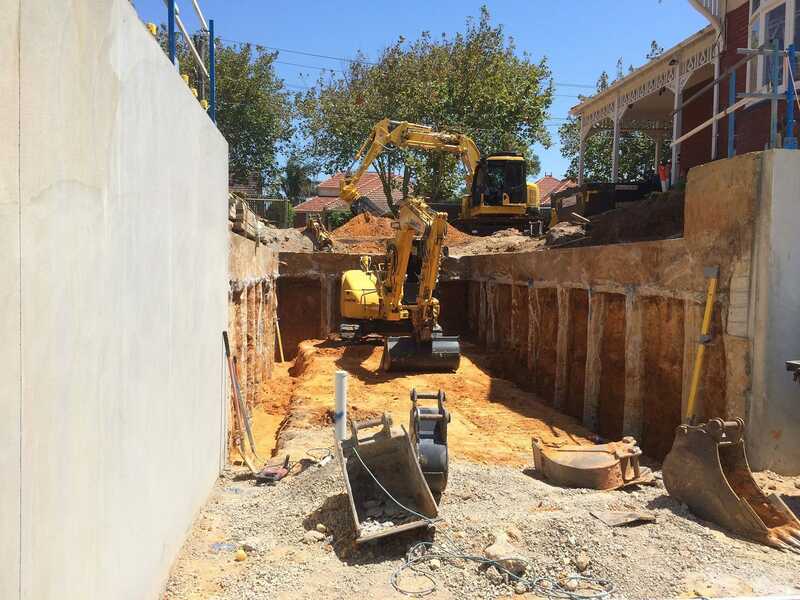 While many companies undertake this type of work, the thing that sets Chalmers Constructions apart is that each stage is undertaken by Chalmers Constructions and not subcontracted out. Equipment is owned by the company to undertake each stage which ensures the job gets done efficiently and cost effectively. Install continuous timber profile to perimeter edges and perform complete and detailed set out for ground floor and basement. Detailed excavation to capping beam and place (say) 75mm thick blinding layer. Detailed set out of concrete piles and capping beam then pre drill through blinding with drilling rig. Formwork to rear of sprayed concrete wall from natural surface level and top of capping beam to underside of suspended slab as basement is part out of the ground. Install (say) 1000 no. dowel bars to piles and place mesh to wall faces with plumber working in conjunction to install vertical strip drains behind shotcrete walls. Spray and trowel finish shotcrete walls. Allow plumber to install basement drainage system and hook up strip drains. Expansion saw cut to basement slab then commence ground floor formwork. Complete formwork, place reinforcement and pour ground floor suspended slab. Construct ground to first floor columns. Construct first floor suspended slab. Given the extensive history Chalmers Constructions has with these jobs, Norm is also willing to assist in advice in the planning stage before plans are finalised and work commences.